This package came at the right time because I was searching for a new mascara. So I was pretty excited when I saw this in my mailbox! maximum volume and fullness with just a single coat. This waterproof formula is also very resistant to sweat, sebum and tears. The new and improved lash king is a godsend if you are like me - curly lashes that lack length and volume. One swipe was enough to give your eyelashes a quick fix. Their brush is a basic mascara brush but what matters the most is the formula. What helps best is also the way you apply it. You have to start from the roots and go all the way up your lashes using the zigzag motion. Still not convinced? See this before and after photos. Look at the difference. I am beyond impressed. The fibers were so lovely to work with, they stick on my lashes easily and didn't drop until I remove them using my eye makeup remover. So, it's definitely waterproof. It last me the whole day! You might think it's clumpy, but it's not! It gives a fair amount of formula on each strand of your lashes. It won't give you a "too much" look. It just enhances your lashes. Since it lasts the whole day, it might take a little bit more effort to remove them at the end of the day. So make sure you use an oil-based makeup removed to dissolve the fibers! You don't want to wake up with panda eyes. Also, if you wear any contact lenses, if any of the fibers fall off along the way, it will sting your eyes and you will have teary red eyes for a good 30 seconds. So be very careful with that. My suggestion would be to use a lash gel to act as a sealant after you apply your mascara. You can grab this at any Watsons store at the price of $25.90. Not too bad, right? It's quite a good price to me! The water-based dial-type eye liner allows you to easily draw ﬁne, delicate lines or thick, bold lines with its felt pen bristles. Entice with a shimmering pearl color on your eye line! Another product that came in the mail was this liner with sleek packaging and a really, really sweet colour. When I swatched the colour, I knew it's perfect for lining the bottom of your eye to give it a more brighter and bigger look. It has a dial-turn pen which is a bit of an issue when it's the first time you open it. So make sure you shake the pen and turn a few times and see the formula slowly flow onto the brush applicator. You can grab this one at Watsons as well for $22.90. I hope this one will last longer. The downside is that I can't see the amount of product left. A bit of a bummer. It's also a bit difficult to control the amount of product you want with that applicator. It will take a while to get used to it! Visit their Facebook page for more info and don't forget to like it! 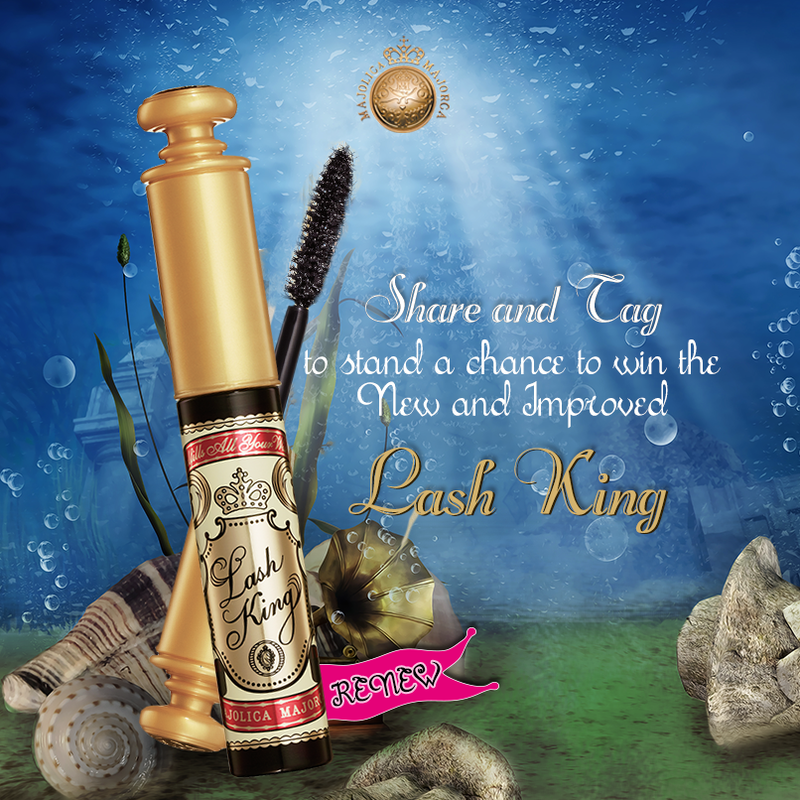 Also, they are having a quick giveaway which you can join easily by by tagging 3 friends in the post's comments section to stand to WIN a new and improved Lash King with your 3 tagged friends! Click here to go straight to the post!